Was signed by the Dolphins as an undrafted college free agent on April 29, 2005. 2010 - Served as the long snapper all eight games this season. 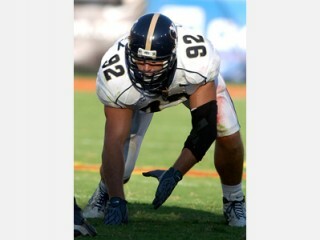 2009 - Served as a long snapper all 16 games ... Recorded seven special teams tackles during regular season action ... Had three special teams tackles at Atlanta (9/13). 2008 - Saw action in all 16 games as the Dolphins long-snapper ... Recorded four special teams tackles during regular season action ... Registered one special teams tackle during the AFC Wild Card playoff game against the Ravens (1/4/09). 2007 - Played in all 16 games, solely on special teams ... Contributed three tackles on the punt coverage unit. 2006 - Participated in every contest, all on special teams ... Registered five tackles on punt coverage unit over the course of the season, in addition to a fumble recovery ... Notched two tackles and a fumble recovery in Monday night game vs. N.Y. Jets (12/25) ... Pounced on a Brad Kassell fumbled punt at the Jets’ 42 in the fourth quarter, leading to an Olindo Mare field goal eight plays later, tying the game at 10-10. 2005 - Beat out incumbent Ed Perry for the long-snapping duties following the preseason and held the spot for all of 2005 ... Was the only undrafted rookie to spend all 16 games on the team’s 53-man roster ... Participated in every contest, all on special teams ... Registered five tackles on punt coverage unit over the course of the season, including two at San Diego (12/11) ... Part of a unit that yielded just 4.9 yards per punt return, the second-best figure in the AFC and third in the NFL. Lettered three years at Brigham Young (2002-04) ... As a defensive end, appeared in a total of 32 games, including 29 starts ... Also handled the long-snapping duties for the Cougars ... Recorded 94 tackles in his career ... As a senior, posted 27 tackles, 8.5 stops for loss, 4.5 sacks and a forced fumble as he was chosen to play in the Hula Bowl ... Amassed 42 tackles, six stops for loss and 4.5 sacks as a junior when he received Academic All-Mountain West Conference honors ... Redshirted in 2001 after transferring from Ricks Junior College in Rexburg, Idaho, where he played in 2000 ... Majored in business management. Married (Christy) with three sons, Austin, Brock and Wes ... Attended Horizon High School in Thornton, Colorado, where he graduated with National Student-Athlete Honors ... Has played the violin since age five and still plays it on occasion ... Enjoys playing golf in spare time ... Has donated time and money for the Dolphins’ annual turkey and toy giveaways ... Has made hospital visits and participated in Hurricane Wilma relief efforts ... Has taken part in the Miami Dolphins Foundation’s golf and fishing tournaments ... Also has been part of the “Lift Up America Food Giveaway” event as well as “Rebuilding Together” ... Growing up, his favorite sports team was the Denver Broncos ... Lists “Family Man” as favorite movie, “Seinfeld” as favorite television show, “Lone Survivor” as favorite book and Dave Matthews as favorite recording artist ... Read to kids at Lee County, Fla., library ... Brother, Ryan, currently is a defensive end with Buffalo after the Bills made him a second-round draft choice in 2002 ... Took part in the inaugural Miami Dolphins Touchdown For Life Blood Drive ... Joined Special Teams volunteers at Feeding South Florida for the Stamp Out Hunger Food Drive ... Full name is John S. Denney, born December 13, 1978 in Denver, Colo.
View the full website biography of John Denney.